As with my Hollywild Park photo, I wish the use of this photo taken at the Dolphin Encounter area of Six Flags Discovery Kingdom in Vallejo, CA were used under different circumstances. One Green Planet used this photo as their lead photo in an article about the mass dolphin killing in Japan and what role dolphin trainers at aquariums and amusement parks have in this ritual. Dolphins being one of my very favorite animals, this makes me sad. 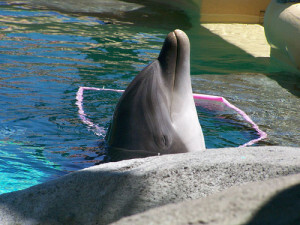 I watched Blackfish and admit, after doing supplemental research, I have a hard time going to see the dolphin shows at Discovery Kingdom anymore, and as much as I’d like to go to SeaWorld once in my life, I also don’t want to give them my money. For similar reasons, I have not yet watched The Cove as I know it’ll greatly upset me (full disclosure, I did swim with a dolphin as an excursion on a 2012 cruise to Cozumel, Mexico). I support them in their mission to at least get dolphin trainers out of the mix at Taiji’s dolphin slaughters. There are several simple actions people can take to help put pressure on IMATA, and make sure it stops its trainers participating in the brutal capture of wild dolphins. If you want to make a difference, go to IMATA’s Facebook page and write a polite but firm message telling them to get their trainers hands off Taiji dolphins. You can also take to Twitter with the hashtag #ShameIMATA to share your demands, or send a message directly to the president at President@IMATA.org.